I’d love to do more exploring of where we live now. As it is, and this sounds like a complaint, but it’s been too dang hot to do much other than just be in the house. And as our latest electric bill can attest, we’ve been in our house an awful lot lately. Ouchie. My parents came over last week for a couple of days. 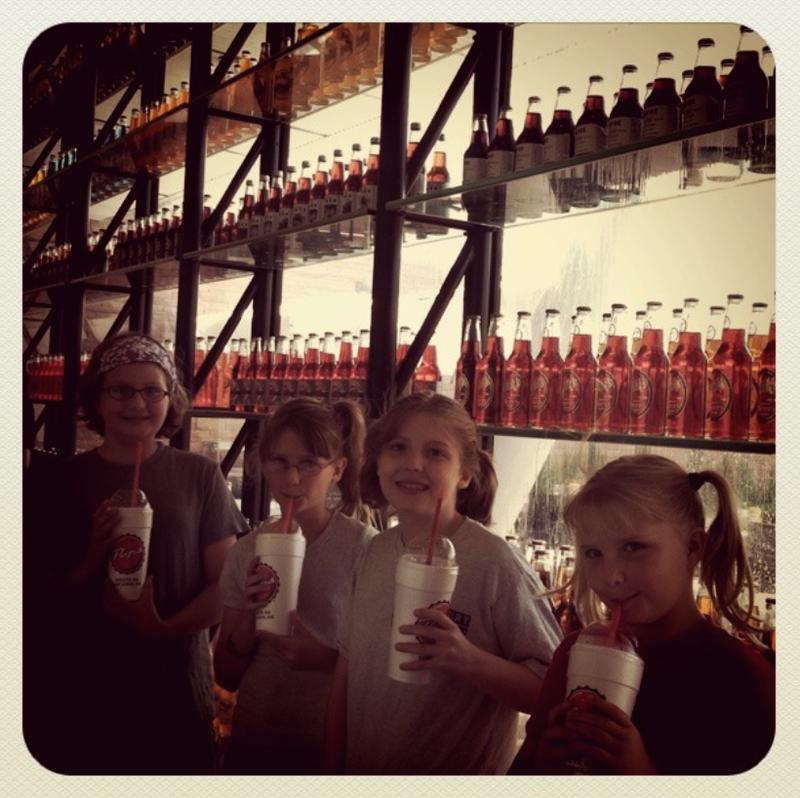 On their last day we went to Pops Soda Shop. It was fun in an over-priced, touristy Route 66 kind of way. Actually, their wall-o-color coded soda bottles was totally awesome and it spurred a fairly detailed, purely speculative conversation between us on what happens when a tornado comes through the area. I don’t think I’d want to be in Pops when that happens. My girls obliged by standing in front of it, but they were happy to get out of the direct sun again immediately after. Our summers in the past have been marked by chronic pool overdose. I can count on one hand the number of times we’ve been swimming this summer. That makes me sort of sad. The pool in our neighborhood is one step above pathetic. It stayed open for 5 weeks between 1-6 on Monday-Friday only. There isn’t an ounce of shade or a single chair, so you can imagine how hot the concrete is around it. Sometimes they only had one lifeguard show up so they would close half the pool. They didn’t require adults to be present, so it was overloaded with unsupervised kids. Good times, good times. I’m tempted to find a clearance sale on a decent above ground pool option for next summer. If you hear of any good deals be sure to let me know. I have just the shaded spot for it. Anyway, all that to say this: I’m sure Oklahoma has a lot of awesome things for us to discover and we will, just as soon as the heat lifts a bit and being outside isn’t the survival chore it is right now. too bad you chose the hottest, record breaking summer to move to OK! oh well, next summer will be a dream.